where the normalization is necessary for obtaining the power exerted by a unit-amplitude dipole assuming linear materials. In FDTD, computing the LDOS is straightforward: excite a point dipole source and accumulate the Fourier transforms of the field at a given point in space to obtain the entire LDOS spectrum in a single calculation. This is implemented in the dft_ldos feature which is the subject of this tutorial. where is the dimensionless quality factor and is the modal volume. This represents another way to compute the LDOS. In this tutorial, we will verify this expression by comparing it to the earlier one. We consider the simple example of a 2d perfect-metal x cavity of finite thickness 0.1, with a small notch of width on one side that allows the modes to escape. The nice thing about this example is that in the absence of the notch, the lowest-frequency -polarized mode is known analytically to be , with a frequency and modal volume . The notch slightly perturbs this solution, but more importantly the opening allows the confined mode to radiate out into the surrounding air, yielding a finite . For , this radiative escape occurs via an evanescent (sub-cutoff) mode of the channel waveguide formed by the notch, and it follows from inspection of the evanescent decay rate that the lifetime scales asymptotically as for some coefficient #. We will validate both this prediction and the LDOS calculations above by computing the LDOS at the center of the cavity, the point of peak , in two ways. First, we compute the LDOS directly from the power radiated by a dipole, Fourier-transforming the result of a pulse using the dft_ldos command. Second, we compute the cavity mode and its lifetime using Harminv and then compute the LDOS by the Purcell formula shown above. The latter technique is much more efficient for high Q (small ), since one must run the simulation for a very long time to directly accumulate the Fourier transform of a slowly-decaying mode. The two calculations, we will demonstrate, agree to within discretization error, verifying the LDOS analysis above, and is asymptotically linear on a semilog scale versus as predicted. We can now set up the -polarized source in the middle of the cavity where we will also compute the LDOS as they are co-located. We know the mode frequency of the closed cavity analytically. Of course, the frequency will shift with the size of the notch which necessitates a Gaussian pulse. Also note that in Meep, frequency is specified in units of 2π. We need to run for a sufficiently long time to ensure that the Fourier-transformed fields have converged. A suitable time interval is, due to the Fourier Uncertainty Principle, just one period of the decay which we can determine using the we calculated previously. 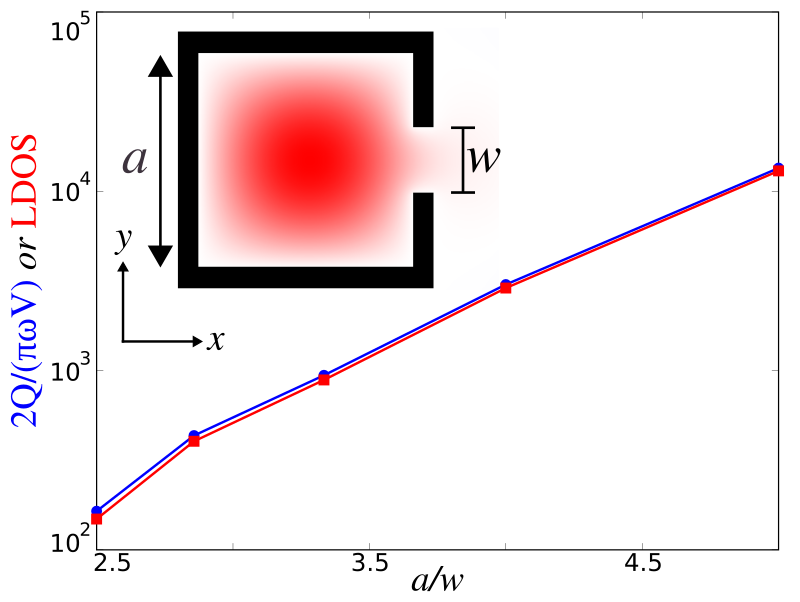 The smaller the notch size becomes and the higher the corresponding of the mode, the longer the simulation has to run. This is why the former calculation is much more efficient for slowly-decaying modes. We run several simulations spanning a number of different notch sizes and plot the result in the following figure which shows good agreement between the two methods.